Nevada State Parks (NSP) will begin cracking down on users of the Spooner Backcountry State Park who don’t pay their fees. Currently, visitors who enter the backcountry from the north and east on foot or bike avoid paying the entrance fees. The majority of users enter the backcountry through the heavily fenced and gated facility at Spooner Lake. Entry fees are collected from vehicles, riders, and walkers as they enter. Bicycle riders pay $2 dollars and walk-ins pay $1 dollar. NSP will begin actively trying to collect fees from users entering from Tunnel Creek and Red House Flume Roads this spring. This will be a self-pay system requiring bikers, runners, and hikers to carry cash with them to put in a pay station. 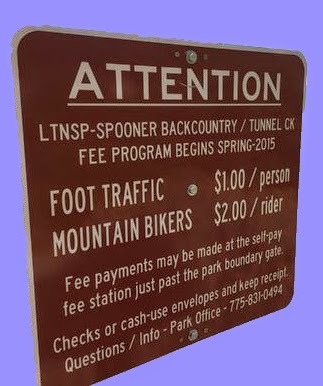 NSP has posted a new sign at the entrance to the Spooner Backcountry from Tunnel Creek Road, advising visitors of the new fee collection program. There is also an annual pass program in the works, which would allow regular visitors to bypass pay stations. Spooner Backcountry is a very popular Lake Tahoe park with more than 12,000 acres of open space, including more than 50 miles of hiking, mountain biking, and equestrian trails/dirt roads. Popular trails include Marlette and Red House Flume Trails, as well as the Tahoe Rim Trail.